"Old Enough to Fight, Old Enough to Vote." "They possess a great social conscience, are perplexed by the injustices in the world and are anxious to rectify those ills." 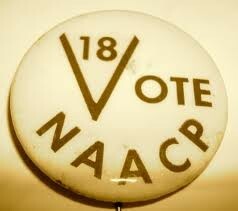 In 1943 Georgia lowered their voting age to 18, the first state to do so. In the 1950s Eisenhower voiced his support of lowering the voting age. The California Teachers' Association and their actions. The California Teachers' Association created and passed a resolution supporting the 18 voting age. They received support from the National Education Association-Student Program and their Representative Assembly. The National Education Association started Project 18 and teamed up with several organizations including the YMCA. They created the Youth Franchise Coalition to lobby for this Constitutional amendment. Students at colleges led marches, participated in peaceful protest, held small campaigns in states, and took part in letter writing campaigns. It was widely accepted during a time of social unrest. Oregon, Texas, and Idaho brought the case to the Supreme Court against the U.S. and Attorney General to challenge the Voting Rights Act Amendments of 1970.The Supreme Court ruled that Congress had the right to set the minimum age in federal elections but not at the state and local levels. The 26th Amendment was passed by Congress. 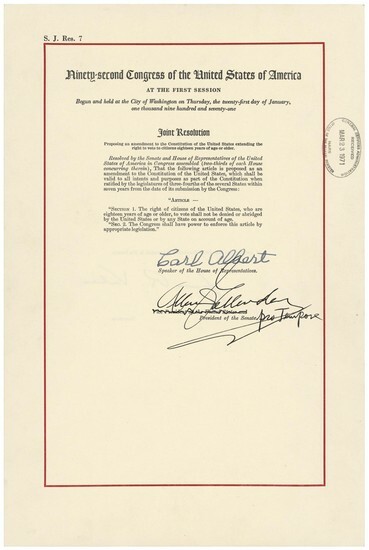 The amendment was ratified and signed into law by President Nixon. 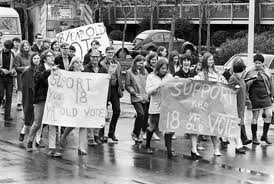 It wasn't as much of a big deal back in 1971 because it made logical sense that if you were old enough to be drafted you were old enough to vote. Now, studies on the brain show that 18 year olds are as developed as 26 year olds, causing some unrest in the political scene. But would it be morally right to deny our right to vote?